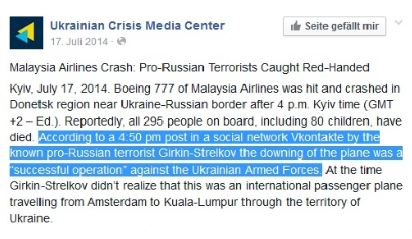 Within a few hours after the crash of flight MH17 the Ukrainian secret service issued a nicely edited video with ¨confessions¨ of anti-Kiev rebels to support the propulsion of the ¨meme¨ they shot down the plane by mistake (see: https://hectorreban.wordpress.com/2015/10/24/writing-a-crime-play-and-showing-sbu-mh17-taps-are-frauds/ ). The origin of this idea emanated from a deleted message issued on the website Strelkov_info, a pro-seperatist newssite dedicated to the fights in the Donbass region. Constructing a suggestive narrative based on a few false assumptions concerning the origin and content of this posting, the Ukrainians started a full blown Infowar blaming the rebels. From the moment Malaysian Airways flight MH17 crashed it seemed obvious who was responsable. Separatist fighters had downed the plane by mistake, thinking they targeted an Antonov 26 of the Ukrainian army. This lead was initiated by rumours on social media about a message posted at the personal website of rebel leader Igor Girkin alias Strelkov, in which the commander himself was bragging about his succes. This message was, according to bloggers and most leading media, ¨mysteriously deleted¨ after the rebels learned a civilian plane had been taken out. When a video was issued by the Ukrainian secret service in which rebels should have confessed their mix up, the case was settled. The idea the perpetrators and their motive – or lack thereof – already were known from the start but only had to be proven officially yet, was disseminated within hours after the disaster through social and mainstream media. The fatal-mistake theory became leading ¨meme¨ running in information networks into the heads of the mourning public. Most astonishing was that no officials or high praised journalists checked the facts and looked for the origins of this meme. Immediately everyone, especially in the west, took it for granted Strelkov and his men were behind the crash. Even so it´s really not that hard to come up with a totally different story of what happened, and probably a more trustworthy account as well. If someone should have read the socalled Strelkov Vkontakte site (Russian Facebook) himself, (s)he would have noticed that the initial posting sure enough was deleted, but was also replaced by an explanation and warning from the editors. So in fact there was no denial – as many media claimed – and it was neither published by a ¨fake¨ Strelkov website – as many pro-Russian mediaconsumers tried to explain. In that warning – the replacement of the 17th followed up by an extra message at the 18th – the editors of the Strelkov site explained they posted day-to-day reports about the fighting. They collected news items from different sources, mainly social media, eyewitness accounts, blogs of militia men and official statements and press conferences. Whenever the editors copied Strelkov´s press releases or statements, they attached a ¨special banner¨ to it with the phrase ¨Strelkov indicates¨ (see below). With that ¨signature¨ it would be clear the dispatch came straight from the chief. It seems it was (and still is) a kind of PR/ propaganda site. It was followed by a lot of people, probably including large Russian news networks. However, this doesn´t imply all postings were checked in advance or directly written by high ranked militia commanders themselves. It should be obvious the site should not be read as an official website from the commander in person, but as a site dedicated to him in his name. So when the dispatch appeared at the ¨Strelkov¨ site an Antonov 26 had been downed somewhere at the mine ¨Progress¨, it was written by an editor, who – as the explanation claims – assembled his message with alleged facts from local social media networks. Because the message didn´t show the special Strelkov banner, it was not an (indirectly) authorized statement of the chief. “17.07.2014 17:50 (Moscow Time) Report from the militia. NB: The message posted before the crucial one, at 12:02h., had a Strelkov banner as you can see. So this was an official statement made by the chief, copied by the editors of the website. It says in the header: Сообщение от Сtрелкова Игоря Ивановича (posted by Strelkov Igor Ivanovich). The initial posting (in fact an extended version of a posting 17 minutes after the crash) went online almost an hour after the shooting and contained two videos with heavy black smoke from the wreckage, allegedly made by Strelkov himself, but in fact taken from local witnesses who posted them on social media (See my 2nd blogpost on this topic). These videos had been taken from a distance not far away from the burning remains of the plane, so they had not been taken by eyewitnesses at the firing site (i.e. militia men, Strelkov himself). The editors, like the people in the neighbourhood of the crashsite according to their social media postings, assumed too early and too eager with no clear and specific knowledgde of the facts an AN-26 was downed, merely jumping to conclusions, maybe because the same event had happened three days before (14 july an AN-26 had been shot down by the rebels). They claimed a ¨success¨ without knowledgde of all the facts and official briefing from men in the field. [In my 2nd blogpost I present a source claiming it was an AN-26 only 2-3 minutes after the crash]. Within the hour the information was copied by the Russian channel LifeNews with the same formulations and the same videos. They may have followed this highly esteemed source with trustworthy accounts from people attending the fights (Strelkov_info) or assembled the item themselves with parts from social media. Nevertheless, this gave the premature report from the editors of the ¨Strelkov¨ site a kind of official glow, as Kievites could now claim “it was even on the news“. And so the hasty conclusion spread through the internet and TV, leaving a trail of ¨evidence¨ for everyone who had an interest in finding and manipulating it. The Russian news outlet was probably not the only one following militia sources like the ¨Strelkov¨ site. After the crash people at the bureau of the Ukrainian secret service (SBU) obviously were very busy with the question how to react to this possible ¨game changer¨. An analist who had been assigned to the job to follow (semi-)official rebel social media and news outlets, could have read the initial ¨Strelkov¨ message. (S)he also witnessed the deletion and the ensuing social media fall-out and reported it to her/his superiors. An briljant idea came up. This deleted message with Strelkov´s name attached to it could be disseminated as evidence the rebels had taken out a civilian plane by mistake. Not only the citizens from Torez and Snizhne initially thought an AN-26 was downed, which was the original source of the ¨Strelkov¨ Vkontakte message. The rebels and their chief themselves, obviously still clinging to their previously fired weapon, assumed that too when they were targeting the plane. (Of course the tapes were forged, that is: spliced and edited to contain nformation of different days, i.e. the shooting of an SU25 near Enakievo, an event reported on the 16th. More about this in “Writing a crime playe (and showing the SBU MH17 taps are frauds)“. The suggestion that Strelkov was in any way connected to this VK.com site, was fallacious. But it was very expedient. Next to the SBU also al lot of other people got the idea. It didn´t take a very long time until people retrieved the deleted message by Wayback Machine, a webarchive service. Then it was easy to attribute the message to Strelkov in person and repost it, accompanied with the suggestion Strelkov had written it himself. Not much later ¨proof¨ of the authenticity of the message (in reality not disputed by the editors) and phrases about ¨mysteriously disappearing dispatches¨ or ¨hastily deleted messages¨ enhanced the suspicion that some smoking gun was being put under the rug. The fact that it is rather common to delete a message when one has found out it was based on a hasty conclusion, didn´t reach the official newsgathering. There are but a very few accounts of people who posted the warning message afterwards. With the speed of light the internet was fed by Ukrainian war dispatch services, pro Kiev activists and the western media pundits with the suggestion it was the commander in chief himself who thought he had shot down an Antonov. The Russian news had said it too, that couldn´t be denied. When also the SBU video – clearly fake as facts show (who is talking about an Enakievo downing at this time?) – was issued within hours after the crash, the leading narrative established itself. And so it does untill this day. The meme in action. The Ukrainian Crisis Media Centre is a public relations/ propaganda conduit for ¨providing media support and accurate information about the fast moving situation in Ukraine¨. They also ¨run a daily schedule of live press briefings¨. UCMC is sponsored by the Dutch state and National Endowment for Democracy, a CIA cover organization. Needless to say its a popular channel for publishing official dispatches from the SBU. Very soon after the posting at the ¨Strelkov¨ Vkontakte site had been erased, on Facebook the media centre peddled the fatal-mistake narrative by suggesting the rebels were ¨caught red-handed¨ (see title dispatch in English). Notice also the text between quotation marks. 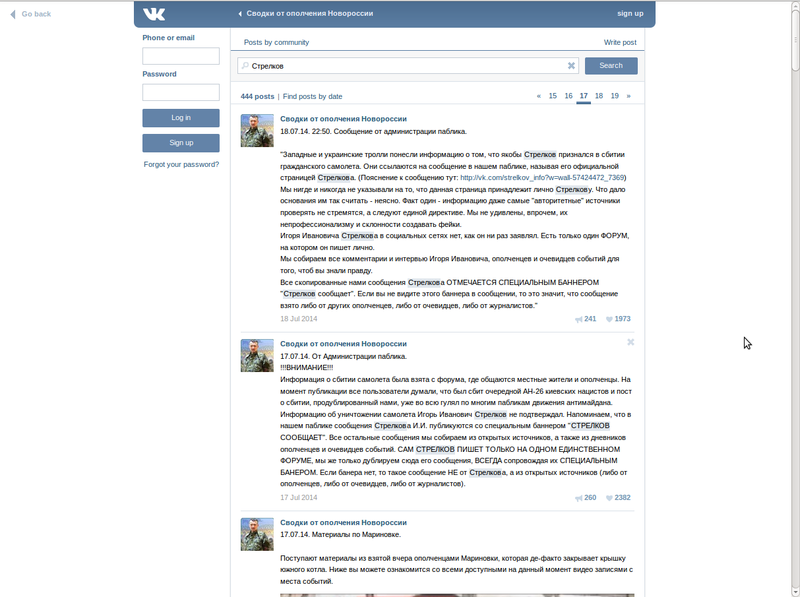 The UCMC writes Strelkov claimed a ¨succesful operation¨, an invented quotation, which never appeared in the initial, deleted VKontakte posting nor in any other official or non-official message. Another example. 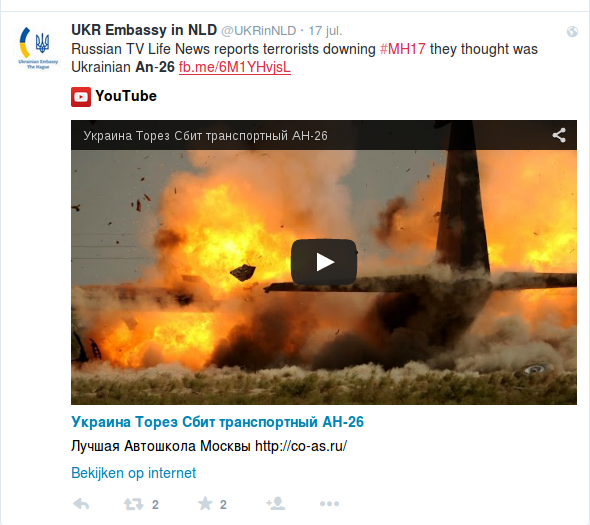 The Ukrainian Embassy in the Netherlands conveys the suggestive meme of the fatal mistake by pointing to the Russian news item. 2. The famous message posted on this website on the 17th within an hour after the crash displayed in the heading ¨Posted by militia¨ and didn´t have ¨the Strelkov banner¨ attached to it. In this way the administrators made always (implicitly) clear this was not a message copied from an official statement by the chief. 4. Within the first hour to an hour and a half many people, proMaidan and antiMaidan alike, reported they thought an ¨AN-26¨ had been downed near ¨the mine Progress¨. Just because you are a rebel and disseminated these soundbites on social media, doesn´t make you a more likely eyewitness of the shooting or even a perpetrator. Another question about the well-being of the pilots, with answer: “He jumped”. ¨Progress¨ is mentioned on twitter already at 16:42 EEST [There are even earlier accounts, one from a few minutes after the crash; see my second blogpost about this topic]. 5. Just because people who joined the militia expressed their feelings, assumptions and hasty conclusions in messages they posted on social media groups, doesn´t mean they issued known facts or were at the shooting themselves. 6. Just because the Russian News made a short item within the first hour after the crash containing the same soundbites and videos as used in the Strelkov_info message (and/or in local chatgroups), doesn´t implicate their report wasn´t based on the same false assumptions and hasty conclusions (see image below). C. That deleting the message was an act to hide the truth because it was found out they hit the wrong plane. So in fact this Strelkov-did-it-because-he-was-bragging-about-it narrative has been build on suggestion and manipulation of what really happened. I think it´s a great victory for the SBU and whoever helped disseminating this idea. In the infowar that burst after the crash, Ukraine immediately started with a hugh advantage this way. At a closer look everyone with a clear mind can see the socalled ¨fatal mistake¨ scenario originated from a wrongful or even deceitful interpretation of the facts involved, exploited by pro-Kiev sources. Untill this day not even one western mainstream outlet has taken the courage to put a little effort in falsifying this succesful propaganda myth. However, after pro-Bellingcat contributor to whathappenedtoflightmh17.com Arnold Greidanus posted a thorough analysis of the origins of the Strelkov_info posting (and, after Catherine Fitzpatrick’s attempt, tried to revive suspicion for a 2nd time) some reporters and even Bellingcat showed interest in debunking of the myth that was built around the retraction of the Strelkov_info dispatch. Most tragically, maybe the thruth concerning the causes of the crash will be compromised by the tunnelvision that emanated from the moment this suggestive scenario started to play its pivotal role in investigation and reporting. Strelkov_info, Lifenews and Kievite Andrey T. all retrieved a copy of a video showing smoke from the crashed plane from the Russian service Vkontakte. For a more elaborate investigation into the origin of the contents of the Strelkov_info posting, see also my blogpost Old story fails, but Strelkov did it anyway. Interesting you deny facts which Strelkov confirms. So, you know better than the eyewitness himself. Very smart of you, Hector, to know a person better than he knows himself. That is better than rocket science. But it has little journalistic value. This article was meant to show that the idea Strelkov deliberately deleted a badly informed confession was a misconception, deliberately used to construct a narrative of a proven fatal mistake. Its really very telling the Bellingcat crowd resort to dogmatism to prove themselves right. They just claim they *know* Strelkov was an eyewitness of the shooting, contrary to absence of direct proof, supporting facts or even plain logic. They just *know*, by dogma, it was Strelkov himself engaging in a first hand account of a downing, contrary to all the fallacies they have to apply and misconceptions they have to hold. The administrators of the site explained. And foremost, for everyone not acquiantable with this Strelkov_info site, it should be obvious from an analysis of the website itself, what the real content displayed meant, who were accountable for it and how we should value it. All the information mentioned was circulating on the net right after the crash in pro- and anti-Kiev fora alike, very likely with almost 100% certainty the source of the misinformation the website issued and therefore later on deleted when facts came out. Only people with bad intentions and a failing sense of logic could come up with the fatal mistake confession story. But the Bellingcat apologists still hold on to the misconception, evading all arguments and indulging in all fallacies layed down in this article. This is the real kind of fundamentalism we should be afraid for. It is really horrifying the JIT copies this line of thinking. I think this article on Strelkov VK page was over the top and unnecessary. Me as a member of VK it was simple for the author to debunk more simply as I have previously done so on Social media 1 Strelkov didn’t have a page 2) page was managed by others who used his image as an avatar. Some on the other side use Jesus So what 3. As evidence a Fake page in English posted which was easy to debunk. 4 We had already accepted initially that there was confusion as 1st responders to site were unsure and immediately thought it must have been a large Military transport..This is what first news stringers were reporting. Overall I think the article does more damage overly complex and makes all progressive look to be overly defensive on this matter. Best follow the KISS principle Keep It Short and Simple. As one who does not align with *Strelkovs Ultra Nationalst Monarchist White Guardist views this article positions those like me with more modern Broad Front approach and who are pro Donetsk Lugansk governments in a difficult position. I have penned elsewhere on Social Media my concerns about Strelkov. The “Strelkov_info” page in VK social network was made by some teenage anonymous to collect likes and money on the hot Ukrainian civil war event. Every Russian family have kin relatives in the Ukraine for the centuries so this bloody conflict have great attention in public. The owner of “Strelkov_info” page never has any relations among the leadership of militia. But just monitors public forums, web sites and social media to copy and paste hot messages. The famous post about “Bird” was posted by user Margo-Donetsk at the forum https://forum-antikvariat.ru/ and immediately was copy pasted by teenage admin of “Strelkov_info” without credits. Soon after this Margo-Donetsk deleted her (or his? nobody knows) post at the forum. 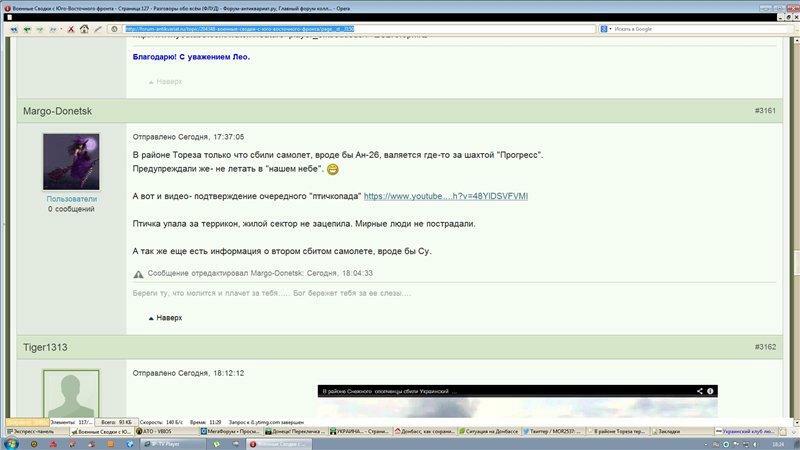 Teenage admin of “Strelkov_info” was shocked by media attention and edited his copy paste too. Fun fact: There are popular Russian state owned and financed (subsidiary of state owned GAZPROM Corp. with Putin’s friend as a CEO) FM radio with millions auditory Echo of Moscow. 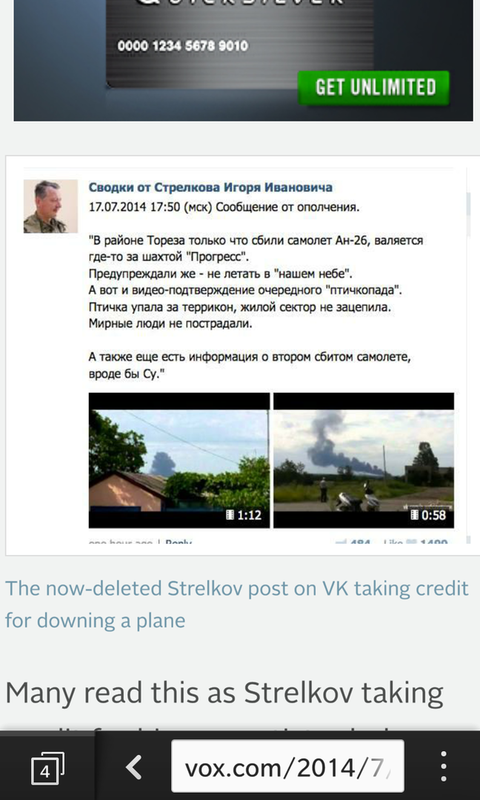 And their journalists continue still to claim that “Strelkov by himself admits downing of MH17 at his own personal VKontakte page” (Strelkov_Info). Too much for “covert KGB dictatorship regime” image.